In a large bowl mix together, cheese, cream, butter, mustard, and Worcestershire sauce. In another bowl, blend together vital wheat gluten, xanthan gum and 2 cups of water. Allow to sit two minutes; then blend into cheese mixture. When pasta is done, cool under cold running water and drain. 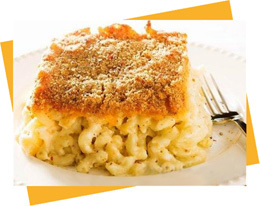 Mix cheese mixture with the pasta and pour into a 9x13 buttered glass baking dish. Sprinkle additional cheddar over top. Place two pieces of dried (or lightly toasted) low carb bread (assuming 4 to 5 grams of carbs per slice) into food processor or blender to "crumb." Mix seasoned salt (and powdered garlic if you like) into crumbs. Sprinkle breadcrumb mixture over top of dish and spray lightly with Butter flavor Pam to soak crumbs. Bake in a 375°F preheated oven for approximately 30 minutes or until cheese is melted and top is lightly browned.